There are many great games that people know are at least twenty years old. Settlers of Catan (1995) for instance. Space Hulk (1989) is another. Here’s a list of great games you might not have realized had reached their twentieth anniversary and then some. Set in medieval Spain, El Grande is the quintessential area control game. Each player has 13 power cards, which they’ll select to determine turn order and recruit caballeros to their courts. In turn, they select actions to maximize their presence on the board, influence the king, or scatter their foes. Players who dominate each region gain points during scoring rounds. Watch out as caballeros ride out of the Castillo to turn the tide. 6 nimmt! is a classic hand management game where players try to collect as few bulls as possible. Played over several rounds, 6 nimmt! offers a take-that element to gameplay that keeps each game fresh and engaging for a large range of player counts. You can also check out the hurricane-themed implementation, Category 5. Formula Dé is a racing game that uses dice ranging from a d4 to a d20 to determine the speed of race cars. Different car models require players to end their turns a certain number of times on each curve, thus determining a maximum speed. Strategic management of both gear shifting and speed are required to win first place. Tichu is a climbing card game where partners try to get rid of their hands while (hopefully) scoring points along the way. Bid wisely to seize victory more quickly. Sherlock Holmes Consulting Detective is a deduction game set in the world of Sherlock Holmes. Join the Baker Street Irregulars at 221B Baker Street for a series of baffling mysteries. Using interviews, newspapers, maps, and other clues, players try to solve the cases faster than Sherlock himself. 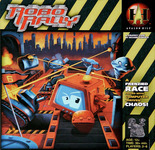 In RoboRally, players try to get their robots safely through the factory floor, which is full of dangerous obstacles and an array of moving components. A player programs a robot’s movements by simultaneously playing movement cards face down. Players then execute their programs, one movement at a time, trying to race from flag to flag. Unfortunately, things don’t always work out the way you planned them, especially when the other robots push you into pits or fire their lasers at you. Did any of these titles surprise you? What are some other classic games that have stood the test of time? How have they influenced modern game design? ← Blackfire Spiele now distributing LudiCreations games in Europe! Magic: The Gathering (1993) comes to my mind.